Sadly and unexpectedly we’ve lost a very special man. Jerry is survived by his loving wife, Stella, his brother Wes, sister Vicky, many nieces and nephews, as well as great, and great-great, nieces and nephews. Everyone loved him and enjoyed spending time with Uncle Jerry (JJ) because he was always so happy and fun to be around. He was always very light hearted and loved to tease you. Jerry was predeceased by his parents (Rose & Edward), 4 brothers (Wilfred, Harold, Henry & Bud) sister, Pearl and great niece, Shannon. Jerry worked for CP Rail for 35 years until his retirement in 1986. 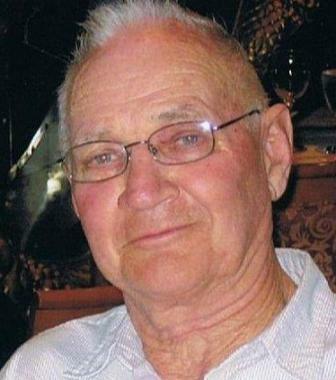 He had a passion for cutting wood and building things and participated in many sports such as curling, golfing, hockey, snowmobiling and waterskiing. Curling by far was his main passion in life to play or watch. He won 5 gold medals in the Senior Curling Championships, many victories and trophies in hockey, waterskiing still in his 70’s and just last week was on the ice at the Chase curling club. Not once did he ever say no to someone wanting to go for a ski or tub ride. He cherished the time spent creating many memories with his family/friends at the Shuswap. Sad to hear about Uncle Gerry’s passing. I am thinking of you at this time. Thank you so much. We are very sad too and miss him greatly! Stella and John. We want to send all our love from Alberta and say that we wish we could be there today. He was a very special and sweet gentle man, and he will be missed by all of us! Always happy and smiling is how I will remember him, and never saying no to taking us on another boat ride. He was one of a kind for sure! We are sending our condolences to Stella and family. It is with sadness that we bid farewell to Jerry. He spent many hours being a great curler and a very supportive member of the curling club in Chase. Thank you so much ,Ray & Jean , he was so special to all of our family , we miss him so much ! We extend our heartfelt sympathy & condolences to Stella & all the family in the sad & sudden loss of Jerry. We cherish many happy memories from our association through the Chase Curling Club. His friendly smile & special brand of energy & enthusiasm will be greatly missed. We are away & unable to attend the celebration of his life at the curling Club on the 28th. You will all be in our thoughts & prayers.